Well folks, it’s been over two weeks since I posted this article about wanting to get off of Facebook. I wanted to let you all in on how I’ve been doing since placing myself on somewhat of a Facebook fast. Notice that I just used the word “somewhat.” No, I’ve not been off of it entirely. I get on to check my messages, then pop right back off again. But no scrolling down the Newsfeed at all. To be completely candid, I did post one lot of items on a local Facebook garage sale site, plus my new blog entries do automatically post on my timeline. Do I feel like I am missing something or missing out on being in touch with the world? Nope. In fact, I’ve cherished the real conversations and interactions I’ve had with real people. I’ve also spent much less time online overall and it’s been great. No, I haven’t seen your whining about the cold, the roads, or winter weather in general. I’m sorry, but I haven’t seen the latest cute picture of your kid or of you. I have no idea what you just cooked for dinner or where you went for date night with your spouse. Overall, I don’t miss being on Facebook and can’t see myself going back to a place where I am habitually checking my newsfeed or frequently posting many pictures or things about my life. (Not that I was on as much as some people, but still…) I may pop on to check in here and there, but I can’t see it having as much of an influence on me anymore. Perhaps if I had close family that lived far away it would be a good tool to see family pics and whatnot, but my immediately family is somewhat close by. To wrap up, I am giving you a challenge if you are intrigued and tempted by the idea of going without social media. Try going without Facebook (or Twitter or whatever you do) for at least two weeks and see how it goes. Perhaps it could be what you give up for Lent. I did mine cold turkey and that seemed to work best for me. Let me know how it goes! 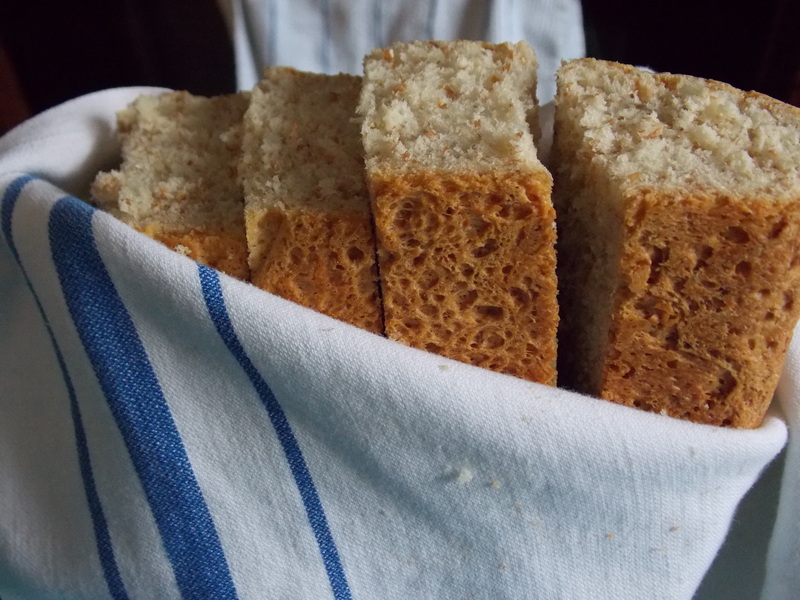 My typical “go to” bread recipe is a honey wheat that I make about once a week. This particular recipe, however, is one I found in an international cookbook. Dissolve yeast in a bowl with warm water. 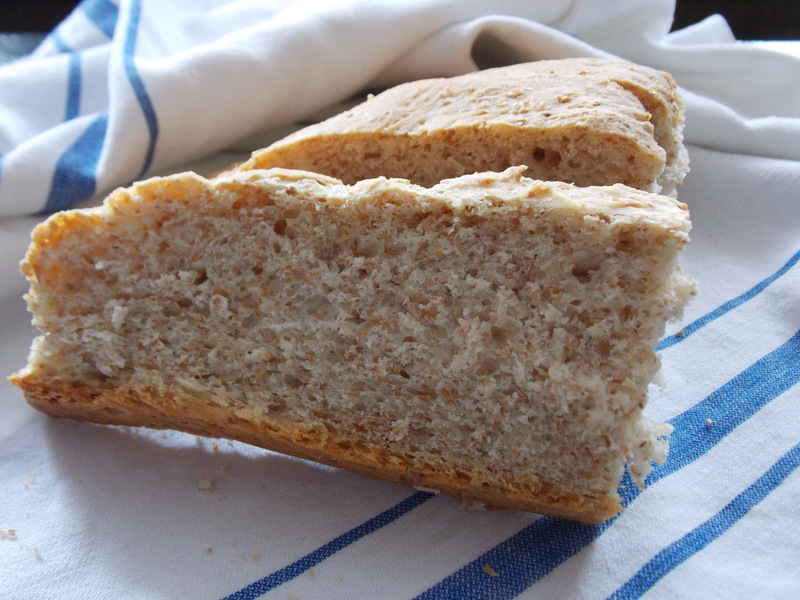 In a separate large bowl, mix salt with 4 C of the bread flour and the wheat bran. Cut in butter with a pastry blender until it is a crumbly mixture. Add yeast mixture in and stir by hand or in a stand mixer until flour is nice and moist. Work in 1 more cup of flour to form a stiff dough. Turn onto a floured surface and knead for about 10 minutes. Add a little more flour to prevent sticking as you go. Place in a greased bowl and flip to grease the top as well. Cover and allow to rise in a warm location for about an hour to an hour and a half. Grease a baking sheet. Punch down dough and knead a little longer. 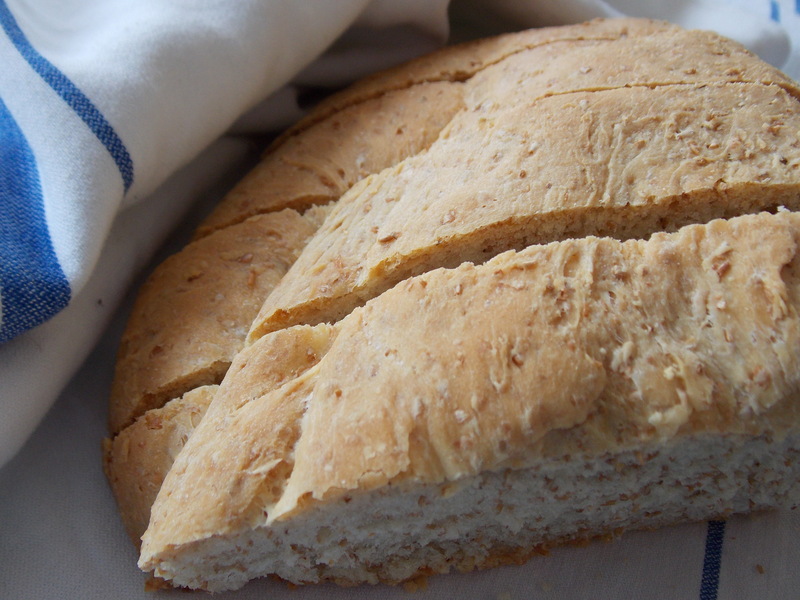 Shape into a round or oval loaf and place on the baking sheet. Cover and allow to rise for about another 45 minutes. Loaf should about double in size during this time! Preheat oven to 400 F.
Cut a 1/2″ deep cross into the top of the loaf. Brush loaf with warm water. Bake for 25 minutes at 400, then reduce to 350 F and bake about 15 more minutes. Allow to cool on a wire rack before serving. The nice crusty underside of the loaf. Note: This makes one giant loaf of bread. 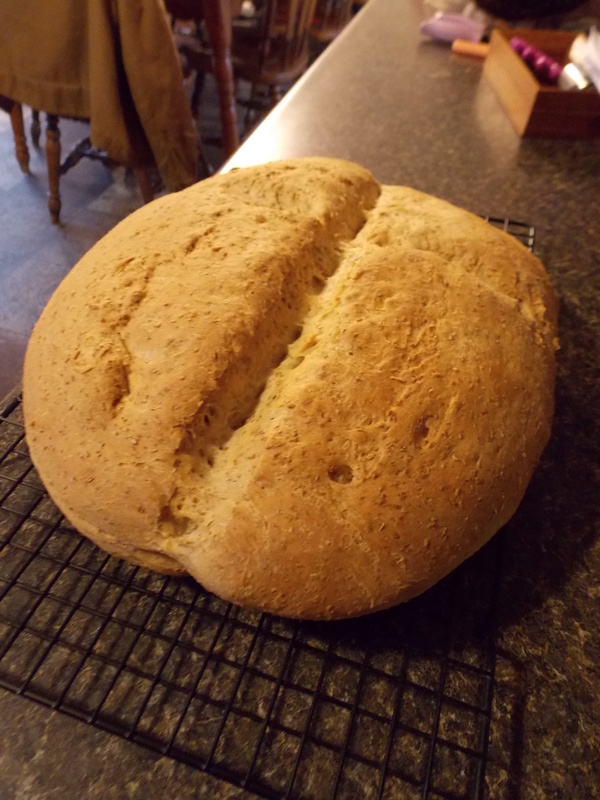 When I make it again I am going to try dividing it into 2 smaller round loaves and figure out the baking times. Also, what we didn’t eat I stored in a paper bag overnight and it was just as wonderfully crusty this morning. Today I have decided to re-post a favorite article from my archives. Hope you enjoy! 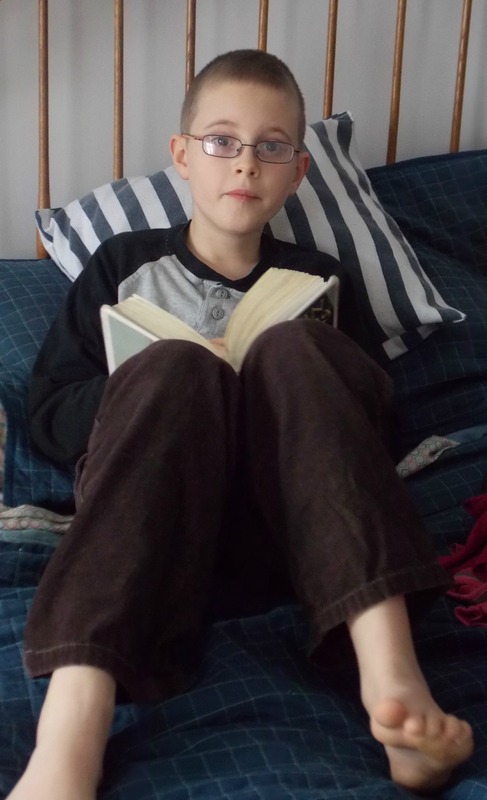 It may come as a shock to some of you dear readers, but I do not homeschool my children. Neither do they attend a private Christian school. Yes, my friends, this product of public schooling sends her brood of children to public school. (Gasp!) A lot of people think we do homeschool, and I really take that as a compliment. Don’t get me wrong, I can see the wonderful aspects that homeschooling has to offer. I really, really do. Many of the Moms on my personal “Most Admired” list homeschool their kids and do an awesome job of it. However, I also know a LOT of highly admirable, godly Mothers who send theirs to public school as well (and their kids are doing great). And lest I not forget, some who choose private schooling for their kids. Oh yeah, and please don’t judge me for sending my kids to the big-bad public school. I personally believe that every family is different, school districts are different, and each one has to choose what they deem best for their family. That’s what we all really want for our kids, isn’t it? Since Day One of entering the world of having school-aged children, this is a decision that so far my husband and I have stuck to. However, just because we don’t homeschool doesn’t mean our kids don’t get “homeschooled,” if you get my drift. Though I desire a great education for my kids, I have an even greater desire for them to love God, learn His Word, and want to share that love with those around them. I believe that we can still instill this in them on an everyday basis. Some days I really do a cruddy job of this, but this is something we really work towards doing at home and in our daily interactions. 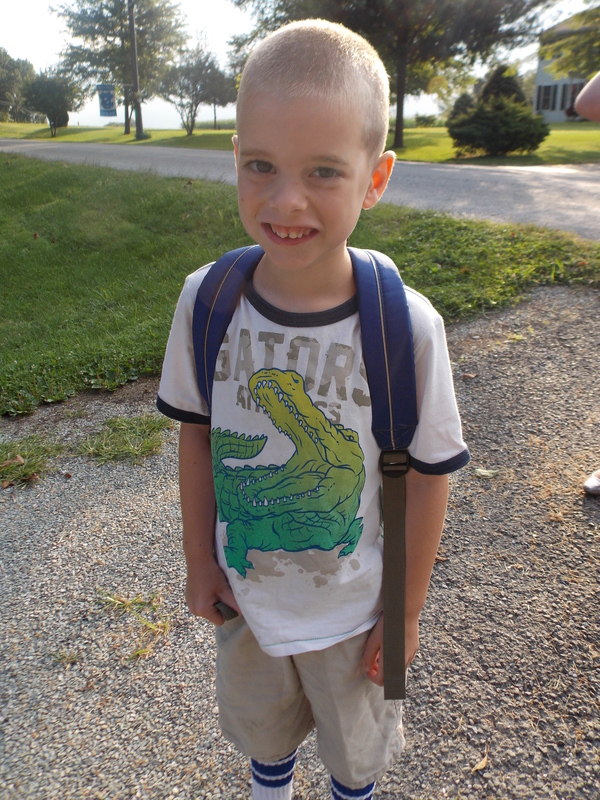 So, how in the world do we “homeschool” without homeschooling? Here’s some examples I have thought of that our own family does. While you read this (hopefully you haven’t tuned out by now!) please don’t think I have picture perfect kids or that I’m some picture perfect supermom. I can assure you that we are most definitely NOT. This is what we TRY to do to instill values, a love of learning, and godly character in our gang. * Be involved in their schooling. Anyone who knows me can assure you that though I don’t homeschool, I am very actively involved in my kids’ school lives. I know their teachers, know their friends, am on PTO, volunteer in classrooms, and make sure they do their best at whatever they’re learning. We do homework Every.Single.Night and if someone is really slacking or struggling in a subject, you’d best believe I’m in the trenches trying to help them conquer that area of weakness. *Experience things together. Summers are especially great for this, but it can be done any old time of the year. Visit a museum, an art gallery, go fishing, take a hike, cook a meal, grow a garden together–it doesn’t matter what or where, just doing things together is important. Kids learn by doing and they need our time as well. *Read God’s Word together. 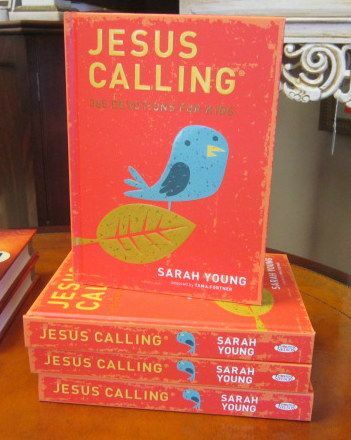 One of the best Christmas gifts we received this past year from my parents was Jesus Calling for Kids. It is a daily devotional that has a short bit to read everyday and then some verses to look up. We have taken to doing this at dinnertime and they remind me when I forget– “Mom, we didn’t do Jesus Calling!” I read the page out loud and they take turns looking up the coordinating verses. *Go to church and Sunday School. As a child, my family went to church every single week unless we were half-dying. My kids also know this is just what we do. It is not an option. We love our church family and they love us. Many of them have taught at least one of my kids in some capacity through either VBS or Sunday School or Children’s Worship and I cherish that. 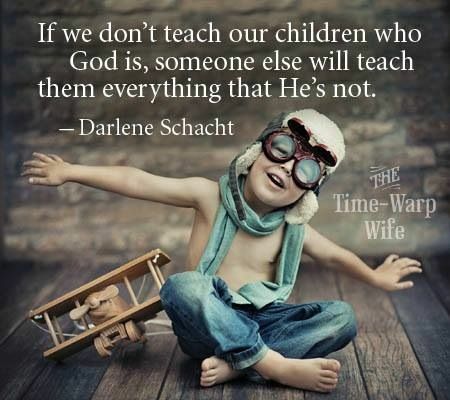 I have taught each of my kids in Sunday School as well. Our small group convenes at our house and they hear us praying corporately together. They know that we are invested in the ministry of our church and we are invested as a family. Church is not just something we go to, it is what we do. *Serve others together. Our kids know that their Dad and I want them to look for ways to serve others, not serve themselves. Whatever my husband and I are doing, we try to get the kids involved too. An example of this is my husband’s role as Head Trustee at our church. He has done this for years and completely rocks at it. It is a habit that whenever he goes to the church to do trustee work, at least one if not several helpers go along with him and he puts them to work. And you know what? This is something they look forward to, don’t complain about, and also ministers to others. *Be a good example. Live it out. Show them that you love to learn new things. Be respectful of others. Use manners. Let them see you studying the Bible. Treat others as you want to be treated. Talk about Jesus, what he has done for us, and how he loves us. Show your kids and your spouse unconditional love. Serve your family without grumbling or complaining. The list could go on, but you get the idea. Some of this stuff is caught, not taught. I’m going to stop right there with my list, but I hope you get the picture. 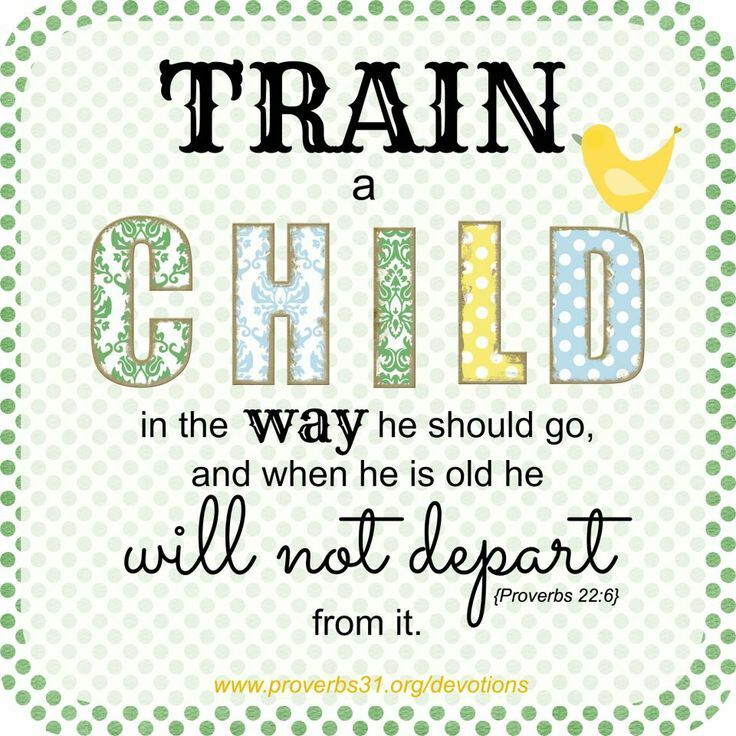 I really, truly believe parents can raise awesome, godly kids while still sending them to public school. What’s really great about this is that they can then shine their light to those they encounter there. We need to be focused on raising kids that are in this world, but not of this world. We are called to be salt and light wherever God has planted us. I have a couple kids that think nothing of popping their Bible into their backpacks. My one son has witnessed to other kids already and is completely unashamed of what he believes. Hallelujah! A former teacher has told me with tears in her eyes how she still thinks about some of the things one of my boys said to her when he was her student a couple years ago. My heart leaps with joy whenever I hear something like this. For now we feel like this is where God wants our family. I’m not saying that I’ll never, ever homeschool. I can see some really great benefits of it. However, if God is using my kids for His glory in the midst of a public school setting, then so be it. Use us, Lord, and use all the other Christian families out there wherever and however they “do” school. What If We Quit Facebook? I’m tempted, my readers. I’m VERY tempted. Of course, I’ve had this conversation in my head and with several close friends multiple times, but have never had the courage to just do it. I want to quit Facebook. For real. What would my life look like without the ultimate time-sucker, Facebook? What would ALL our lives look like without it? Or any other social media? Here are just a few things that immediately spring to mind…. *It may weed out who our real friends are in a hurry. I’ll be straight up honest with you–I do not really have hundreds of “friends.” I have like, a couple of really close ones and a handful of others, plus some acquaintances that I’m fond of and enjoy talking to. When I have something important in my life, or they have something going on in theirs, I would much rather hold a meaningful conversation with them than see it on a Newsfeed or post it on my own. Do I really care about what someone I knew 20 years ago ate for dessert? Um, no. *We would have more time on our hands. This is like a “duh” one for me. Unless you have a great deal of self-control and can really limit your FB time, you probably spend more time on there than you care to admit. If there was some kind of tracker (I’m sure there is) that showed how much time each day or week I have popped on there, I’m positive that I would be mortified at the time I have wasted. It kind of kills me when people share that they “don’t have enough time” to do this or that, yet they constantly post things or comment about things on Facebook. Part of me really wants to say, “Well, you apparently have SOME extra time on your hands…” I know that I would be much more productive if I weren’t on there at all. *We could engage in real life. How many times have you or I stared at a screen while the real stuff of life was going on around you? Maybe it was when your son was asking you to play a game or your spouse wanted just a little alone time with you. Instead you (or I) chose to look at a screen and mindlessly scroll through what others choose to post online. I’ll be the first to admit that I’ve been guilty of this one before. Yes, I preach about having quality time with your family, yet I have neglected them or maybe just tuned them out at times. All the while I’m being tuned in to the latest funny video or an article that catches my interest. Things that don’t matter one bit when compared to precious moments with the ones that DO matter. *We could socialize for real. As stated before, I would much rather talk to you in person than feel “connected” only by what you post on FB. I’m really afraid that we’re raising a generation of kids who hardly know how to converse and relate to one another. My family was at a burger joint this past weekend and sat near a table filled with teenagers. It was rather sad to see them all looking at their devices most of the time rather than actually hanging out and speaking to one another. It’s not only teenagers, it’s definitely adults too. It’s time we took back our real relationships and truly invest in one another. *We could take pictures for ourselves, not to display for everyone and their brother to see. (Yes, I am totally guilty of this one too!) Ever caught yourself doing something or going somewhere and automatically thinking what a great picture you could take just to put online? Then to put said picture on and constantly check to see how many people like it or comment on it? I have, and I feel just a little bit sick even admitting that. 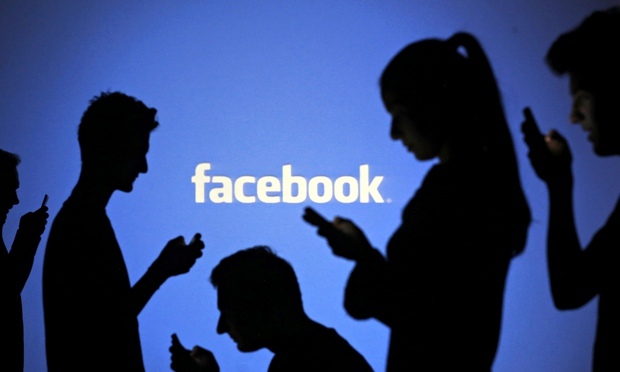 Before FB existed, didn’t we take pictures simply to capture memories of people and places? *We wouldn’t be inundated with every detail about everyone’s life. I’m sure your child is absolutely precious, but I don’t really need to know every witty thing they said to you today. Or, I’m sorry you are having a bad day, but please don’t rant on about every detail for the world to read. Or, not that I don’t care what your opinion on ________________________ is or your political views, but do you really need to put down everyone who doesn’t agree with you? I feel like we are being bombarded constantly with this stuff and it is sometimes draining. I’m to the point where I don’t want to know. It’s just all too much sometimes. *We wouldn’t fall into the comparison trap quite as often. One of the articles I wrote that I am most proud of is this one, written last summer. I had so many folks (all women) who came up to me personally and told me how they related to that article. Yes, I think we would all still struggle a bit with comparison, but I don’t think it would be quite as prevalent as it is with those who are on FB. On Facebook you are only seeing what people WANT you to see, not the whole picture. Heck, you may think I live an utterly charmed life sometimes if you only saw what I put on there. How do you feel about all of this, and what do you think our lives would look like in this day and age without Facebook or other social media? Anyone up to the challenge of a Facebook “fast”? If you are, let me know and maybe we can work on it together! Thanks for tuning in and stay warm!